My daughter's 11th-grade science project idea involves soil decomposers, and we're stuck. She is testing 3-5 decomposers in Martian type soil to investigate which best supports growing microgreen kale. The hypothesis is that a self-sustaining non-chemical dependent model will succeed. It may be applied to restoring other poor soils in future research. She is using earthworms and ?? -we're stuck. Her biology and biotech teachers weren't helpful. I thought composters would know more. Do you have advice, and where can we obtain supplies? Soil information: Mojave Mars Simulant was developed in 2007 by NASA and JPL - high-quality, iron-rich basalt from the exact same deposits used by the JPL. Whole rocks are crushed to grades ranging from dust to gravel, sift-separated into several grades, sterilized, and then packed and vacuum sealed. 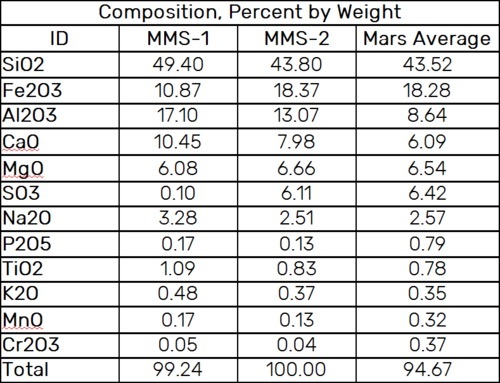 Below is the chemical composition of the "Martian" soil. Hello Samantha. What an interesting question. I love that you are looking at developing a project that features soil biology. There are a few problems with your idea though. First let’s look at composition of the soil. This martian soil is 100% mineral, essentially ground up rock. Decomposer organisms need something to decompose. In other words they need organic matter, and this mineral soil has none so they would starve. Does this mean you can’t use the martian soil for your project? No. It just means you might want to try a different experiment using different classes of soil organisms and different plants. My friend Volkmar, who is a retired soil microbiologist, says you can’t build healthy soil without plants. If you want to use the martian soil I’d suggest you shift your project to see how plants build healthy soil from something that is essentially ground up rock. The martian soil has most of the mineral nutrients plants need but they are not in a plant available form. The biggest missing ingredient is nitrogen and plants need nitrogen in a plant available form to grow. Microbes also need nitrogen to reproduce. So to get plant available nitrogen you need some sort of nitrogen fixing bacteria. Typically you would use a legume that has been inoculated with rhizobia bacteria. The other difficulty is that the minerals in the soil are at present locked in the rock. The best thing to use to unlock those minerals is mycorrhizal fungi. These fungi infect the roots of plants forming a symbiotic relationship. They are able to mine the soil for the nutrients the plants need and then transport them back to their host. They work well with nitrogen fixers too. But while they do partner with around 90% of plants they do not partner with the cabbage or brassica family and kale is a brassica. The bonus with the fungi is that typically you will get some humus forming at depth in the soil. This is very cool as humus is carbon rich and so draws carbon out of the air and stores it in a nice stable form in the earth where it does all kinds of good things. So short answer is decomposers will starve, classes of microbes to try are nitrogen fixing bacteria and mycorrhizal fungi, and change your plant choice to one that partners with those fungi. A final thought is that biodiversity rules so using a combination of plant types might be a good idea. Combining a legume or several legumes with a grass like oats or rye rather than using a single species would likely work better. If you explore this site you'll find articles on nitrogen fixing bacteria and mycorrhizal fungi. For your supplies first you'll need seed. You can find legume seed and mixes of legumes with grasses along with needed inoculants here. This company will help you in selecting the best product for your project. As well you need the mycorrhizal inoculant. You can buy mycogrow, a very good inoculant here. Feel free to get in touch with me through my contact me form if you have more questions. Hope this is helpful.